I used to have a HUGE problem saying no and taking too much on. You see when I was a kid I was told to help people – because my mum was a ‘helper’. She’d always be rushing round doing things for other people under the banner of ‘being helpful’ and so naturally I did the same. This carried on through the first part of my career and I remember my to do list being a mile and a half long because of this. And I realised that whilst I was taking on too much I was neglecting myself…and sooner or later I was going to suffer. 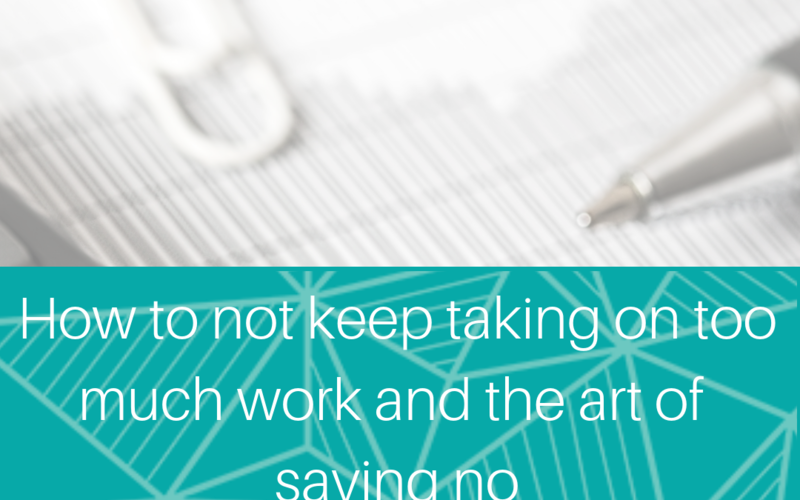 So I completely switched my mindset about saying no, and what ‘being helpful’ now meant to me. 1. I wrote a list with 2 columns. Column 1 was – Need to do (this included, work things, and things at home that had to happen) and column 2 was Want to Do – these included hobbies, spending time with family, friends, personal aspirations and goals. 2) I then put a tick next to all the things that I didn’t have time to do (no prizes for guessing that there were a lot of ticks on that list, and yes they were all in the want to do column! – Another big wake up call! 3) I changed my criteria for what was now going to be a Yes. This was – If it fit into one of the columns eg I needed to do it, or I wanted to do it – it was a yes. If not, it was a no. (Word of warning here – sometimes my brain would try and convince me that I needed to do it – this was just my old habit talking…so if this happens to you, challenge your own thinking and ask yourself why?! 4) I practiced saying no. Now, this was actually the hardest part, and it really triggered me at first. I’d get this feeling that I should say yes, after all if I didn’t do it, who would? and so on. But I kept at it and found a way that suited me. ‘Sorry, I can’t help with that.‘ worked wonders…you can add on a reason if you want at the end, but often that was enough. No-one thought any less of me. No-one. They just said – ‘OK’ and carried on with their lives. I got more done – and I mean A-LOT more done! And…I had more headspace and was less stressed, overwhelmed and frustrated – because I realised that most of the things that I was saying YES to, I didn’t actually want to do in the first place. I’d love to know – what’s your biggest problem when it comes to saying no?